Current Areas of Interest : Teaching, training and consulting in the areas of Project Management, Quality Masnagement, and Individual & Organisational Effectiveness. Hitesh Bhatt works in the area of General Management. He holds a degree of B.Tech from I.I.T Delhi and M.S. in Industrial Management from Georgia Tech, Atlanta, USA. 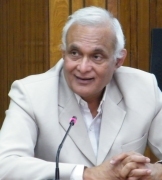 He started his career with Reliance Textile Industries Limited in 1979 and has a total of 18 years of industrial experience - of which 8 years in senior positions of CEO/Country Head of large organisations in India and Tanzania. Apart from Reliance, he has worked in Mafatlal group of mills, Sunflag group of textile and garment factories in Tanzania, and finally a joint venture company (Indo-Bhutanese-South Korean) in Sanand, Gujarat. During this period, he set up of 2 large textile mills and revived another textile & garment factory (employing over 2500 persons) from "near closure" to a position of envy in East Africa. Since 2001, that factory is the most efficient operation in the entire East Africa. He started his academic career in 1995 with IRMA as an Associate Professor and since then has been involved in teaching, training and consulting in diverse areas. in between he also worked as Professor & Head of Centre for Management Studies at Dharmsinh Desai Univesrity in Nadiad, Gujarat. He has trained different cadres of persons in a variety of organisations - government, non government, cooperatives, dairy unions, industrial units, educational institutions and corporate. He has delivered talks in a number of organisations both in India and overseas on diverse topics. His current areas of interest are project management, quality management, operations management, individual & organizational effectiveness and developing soft skills for employees in an organisation. Simulation Game, "Red Beads Experiment"